The false-color, infrared image of the GJ 504 system. The star (center) has been blocked out, and the planet appears a white blob at the upper right. At today’s journal club, we discussed the recent paper Kuzuhara et al. (2013), which reports the discovery of an extrasolar planet with a mass of about 4 times Jupiter’s mass but in an orbit more distant from its sun than Neptune is from ours. The image at left shows one of the discovery images, taken at infrared wavelengths. At these wavelengths, usually a planetary host star is shining much less brightly than at visible wavelengths, which makes it easier to see radiation from the planet. However, for the kind coronagraphic imaging here, the star still has to be blocked out to prevent the glare from masking the planet (and blocking out the star completely is hard to do, as evidenced by the orange and blue speckles in the image). 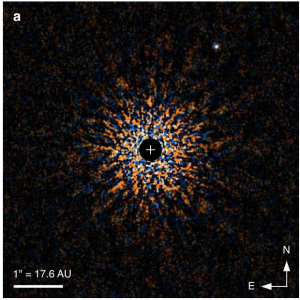 This planet is particularly interesting because it is the oldest planet (it’s at least 160 million years old) to be observed with this kind of direct imaging technique. Younger planets are usually hotter and emit more radiation, and so it’s easier to see them when they’re younger. Although this system is one of the oldest directly imaged, it’s still very young compared to our solar system, which is about 4.5672 billion years old. 160 million years after our Sun formed (and the solar system got its start), the Earth and other planets had already formed, but the Earth was very different from the way it is today. For example, water may have already collected in the oceans, but our atmosphere was probably composed of carbon dioxide and water, with essentially no oxygen. Oxygen came later when life got started. So studies like this one can allow us to peer back in time to figure out, among other things, what planets look like when they are very young and piece together to story of our solar system. Today’s DTM Seminar speaker was Prof. Zhigang Peng from GA Tech‘s Earth and Atmospheric Sciences Dept. He talked about a kind of earthquake (he called “tremors”) that is triggered when the seismic waves from another larger earthquake pass by. The relationship between earthquake duration and strength (as measured by the seismic moment) for these tremor quakes is apparently much different than for normal earthquakes, suggesting they result from different geophysical mechanisms. 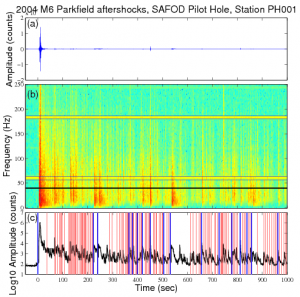 The part of the talk that stuck out most for me was when Prof. Peng played the “sound” of an earthquake, generated by speeding up the seismic vibrations from measured earthquakes. This “earthquake music” is available on his website, but I have posted one such recording below. 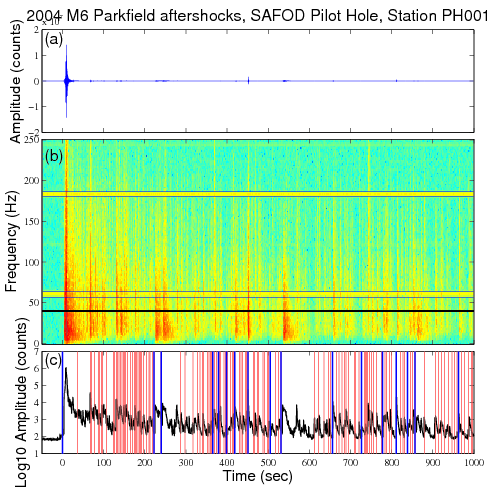 Apparently, different kinds of earthquakes make different sounds, and so these recordings can be used to tease out information about the quakes. Figure 2 from Cuk & Stewart (2012) showing the range of model outcomes for different impact conditions. In Friday’s DTM seminar, Sarah Stewart-Mukhopadhyay of Harvard gave a fascinating talk on the origin of the Moon and the effects of large impacts on the Earth’s volatile inventory. Lots of evidence (geochemical and astronomical) say that the the Moon originated in a large impact between the proto-Earth and a roughly Mars-sized rogue planet (often called Theia). This explanation accounts for many of peculiarities of the Earth-Moon system, EXCEPT that geochemical data says that Earth and Moon probably formed out of the same material. Old models of the Moon’s formation showed that Moon should have formed mostly out of the impactor, Theia, which (like all other solar system planets) was probably compositionally distinct from the Earth. So the Moon SHOULDN’T be Earth’s compositional twin. Instead, Stewart and Cuk suggested that the pre-impact Earth was spinning much faster than previously assumed, with a day that lasted about 2 hours, and so enough material from the proto-Earth could have been launched by the impact to make the Moon mostly out of the proto-Earth. Once the Moon formed, Stewart and Cuk suggested it could interact gravitationally with the Earth and the Sun to reduce the Earth-Moon angular momentum and bring it into line with what we see today, removing the one big objection to their fast-spinning proto-Earth idea. In the last part of her talk, Stewart discussed what such large impacts might do to the gases trapped inside the young Earth. Contrary to popular thought, she suggested that these large impacts actually might NOT melt most of the Earth’s outermost layers, and so the Earth could retain in its interior much of the nebular gas that it was born with. 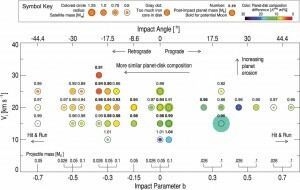 This idea could help explain geochemical data that suggest gas trapped in different parts of the Earth’s interior currently have different isotopic compositions and would mean that the Earth retains geochemical scars from its adolescence once thought completely erased by the violence of the early solar system. 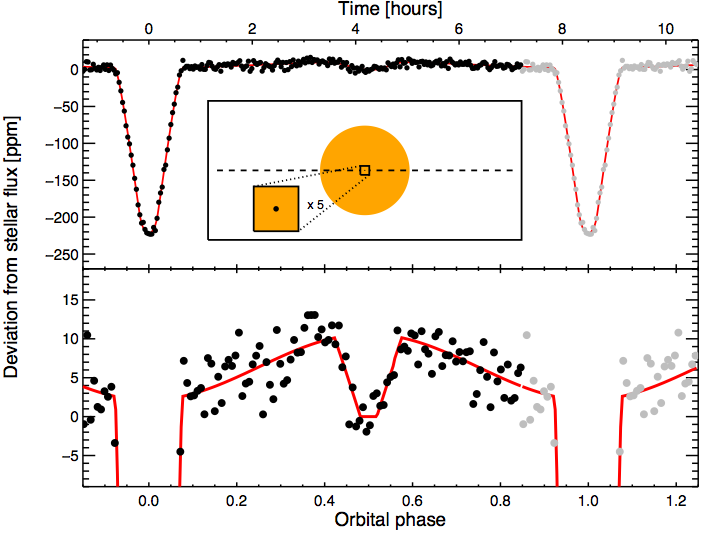 Figure 3 from Sanchis-Ojeda+ (2013) showing observations of the Kepler-78 b’s shadow as it passes in front of its host star. I sat in on University of Maryland Astronomy’s colloquium, today given by Roberto Sanchis-Ojeda of the Kavli Institute at MIT. He discussed his recent paper announcing the discovery of Kepler-78 b, an Earth-sized planet with on orbital period of only 8.5-hours. In such a short orbital period, this planet is only 0.01 AU distant from its host star, almost 100 times closer to its star than the Earth and 40 times closer than Mercury are to our Sun. Unfortunately, since the planet is so small, we don’t have a direct estimate of its mass, but so close to its sun, the planet’s day side is baking at a temperature probably greater than 1,500 K (2,200 degrees F), above the melting point of rock — The planet’s day side is probably covered by a lake of molten rock. Kepler-78 b is one of a few very hot rocky planets discovered so far and the shortest-period transiting planet confirmed. CoRoT-7 b was the first one (discovered by the CoRoT mission), and Kepler-10 b was the first rocky planet discovered by the Kepler mission. The origins of these very hot rocky planets are unclear — they probably didn’t FORM so close to their host stars (although some have suggested rocky planets MAY form very close to their host stars). 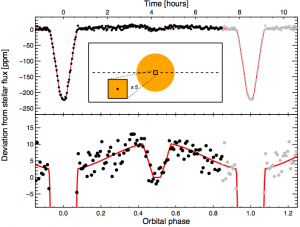 In any case, they represent yet another entirely unexpected but exquisitely interesting discovery in extrasolar astronomy. In journa l club this morning, we discussed the recent paper by Deming et al. (2013), just accepted for publication by the Astrophysical Journal. 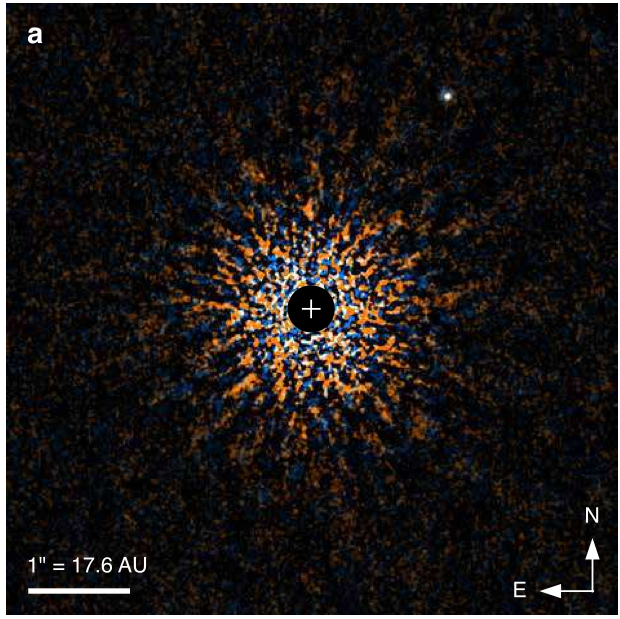 In this study, the authors observed the planetary transits of HD 209458 b and XO-1 b using the Hubble Space Telescope in the near-infrared (about 1-1.6 microns in wavelength) to look for spectral features of water and other molecules. These features tell us whether water and other molecules are present in a planet’s atmosphere, how abundant those molecules are, and even where the atmosphere they are located. In this case, the authors saw spectral absorption from water molecules (see the left portion of the figure at left), but the amount of absorption (the depth of the absorption band) isn’t as large as it would be if the atmosphere were clear. Instead, the relatively shallow absorption feature suggests that there are clouds or haze suspended high in the planet’s atmosphere. 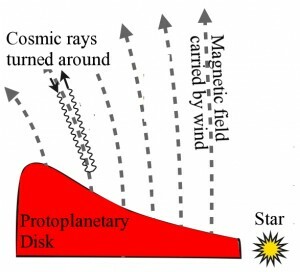 The cartoon in the right portion of the figure shows how this works: Panel (a) illustrates the passage of light emitted by a planet-hosting star through a clear planetary atmosphere, on the way to the telescope. 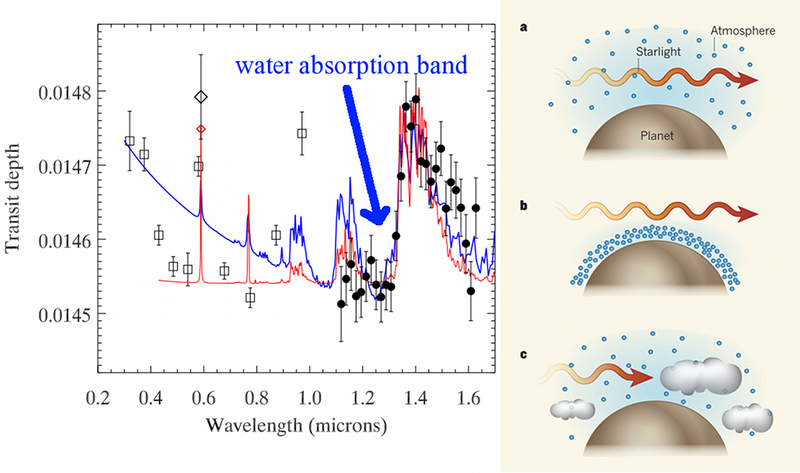 As the light passes through, the water molecules (blue circles) imprint their spectral absorption feature. By contrast, panel (c) illustrates the passage for a cloudy atmosphere. The clouds block a lot of the light before it reaches the telescope, and so only the photons that pass high above the clouds, where there’s not much water to absorb light, get to the telescope. As a result, the water spectral feature is less deep. The new techniques developed in Deming et al. (2013) may open the door to totally new astronomical observations. 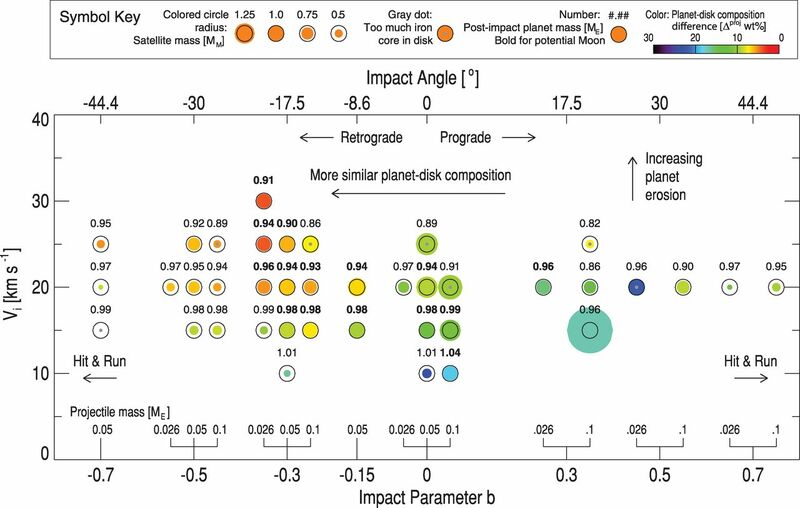 For example, the authors suggest that the significantly improved sensitivity of their technique may allow astronomers to directly observe meteorological variability (weather) on these distant exoplanets. In journal club this morning, we discussed a new paper by Cleeves, Adams, & Bergin that pointed out the important (and apparently previously unrecognized) role of stellar wind in the chemistry and dynamics of protoplanetary disks. Astronomers have long believed that cosmic rays induce significant ionization in protoplanetary gas disks around young stars. This ionization is important because (1) it drives chemical reactions, helping to set the initial compositions of planets, and (2) it causes the disk to interact with magnetic fields, producing turbulence in the disk, which affects where/how/when planets form. 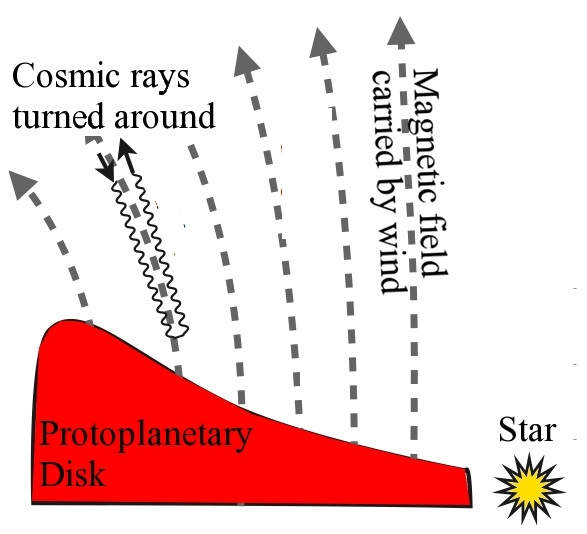 If, as suggested by the authors, the stellar wind can exclude cosmic rays from the inner reaches of the disk, then sufficient ionization to power these two effects requires some additional energy source. Cleeves and co. suggest decay of radio nuclides, which produces ionizing gamma radiation, may be able to take up the slack, but in our discussion, it was suggested that gamma rays might drive different chemistry from what was expected of cosmic rays.